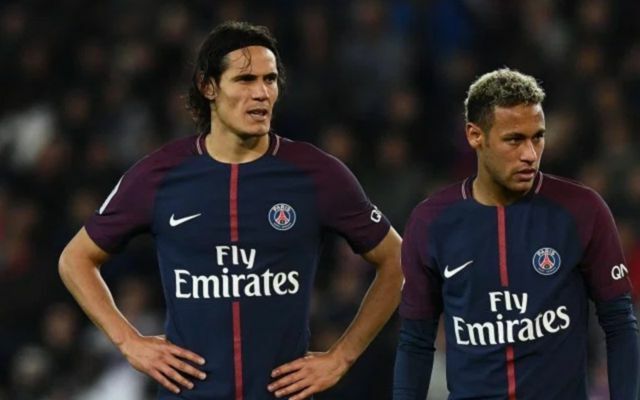 PSG and Brazil star Neymar has demanded that the Ligue 1 side sell teammate and Uruguay international Edinson Cavani following a bust-up between the pair which started over a penalty dispute, according to the Daily Mail. As reported by Spanish publication SPORT, which was re-reported by the Mail, world-record signing Neymar, who cost his side £198M in the summer as per the Telegraph, has made he feelings and thoughts regarding the situation very clear, with the 25-year-old seeing it as being ‘impossible’ to work with the former Napoli following the scenes that occurred in their 2-0 win over Lyon in the league on Sunday. The dispute started after Cavani didn’t let Neymar take a penalty in the 75th, which the Uruguayan missed, with the pair then taking their argument to the dressing room where they fell out further, as per the Mail. PSG and their owner Nasser Al-Khelaifi now has a tough decision to make regarding the future of 29-year-old Cavani, as he attempts to smooth over the cracks that have emerged between Neymar and the Uruguayan. As written by the Mail, many believe that Neymar’s motivation to secure a move to Paris was in order to leave the shadow of Barcelona star Lionel Messi and become the main man as one of Europe’s top clubs, with the Brazilian feels he should be the French side’s primary outlet going forward due to the amount of money he cost the Ligue 1 giants. Should Cavani end up being sold by PSG, it remains to be seen whether Neymar’s world record move to PSG will be causing more harm than good in the coming years.